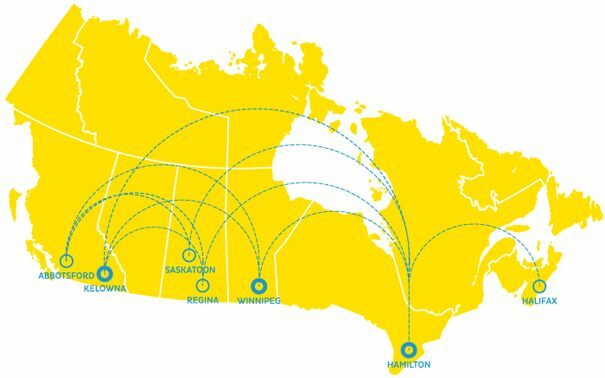 New Leaf, Canada's has officially launched, and they've released their route map, including flights to and from Kelowna. How does this compare to what the Air Canada / WestJet duopoly typically offer? To Regina or Saskatchewan, it's about 40% below the typical price of $300 roundtrip. They are also non-stop flights. Air Canada & WestJet require a stop in Calgary or Edmonton each way. To Winnipeg, it's about 33% below the typical price of $350 roundtrip. To Hamilton, it's about 40% below the typical price of $500 roundtrip. They are also non-stop flights. Air Canada & WestJet do have non-stop flights to Toronto. So it becomes a question of whether saving 40% is worth the hour drive from Hamilton to Toronto. New Leaf's low cost model is similar to what you find in Europe, meaning their prices include just the seat on the plane and a small carry-on item, and everything else (absolutely everything) costs extra. Seats can be booked at www.flynewleaf.ca - and they begin flying on February 12, 2016.
kelowna, winnipeg, YLW, flight deals, ontario, toronto, canada, north america, newleaf, regina, yqr, saskatchewan, saskatoon, yxe, ywg, manitoba, hamilton or yhm. One Response to "NewLeaf launches, offering flights from Kelowna to Saskatchewan and Ontario for $178 to $289 CAD roundtrip including taxes"